Since the late 19th century, Austrian archaeologists have been excavating and researching the Ephesos site in modern-day Turkey. Ephesos (or Ephesus, depending on whether you’re Greek or Roman), was a thriving city in classical times and the location of one of the seven wonders of the world: the Temple of Artemis. The Ephesos Museum displays some of the results of the archaeologists’ efforts, gifted to Austria by Sultan Abdul Hamid II of the Ottoman Empire at the turn of the 19th and 20th centuries. Essentially, you have a variety of statues, reliefs, architectural elements and other bits and pieces from the excavation work. Without a deeper understanding of Greek and Roman art and culture, it’s hard for the layperson to appreciate the individual items for themselves, though they come with detailed descriptions. What does come across, for example, is the monumental nature of the original site, a settlement housing tens of thousands of people with numerous civic buildings. The worn antiquities, often incomplete, seem to hint at an alien civilisation almost lost to history. Equally, you gain an understanding of the huge effort and meticulous research work that has obviously gone into unearthing (literally and figuratively) the history and treasures of the site. 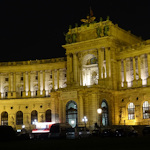 The collection sits within the Neue Burg wing of the Hofburg palace complex. The new wing should have housed royal apartments, but wasn’t ready until after WWI, by which time there were no longer any royals to go in them. So the Neue Burg was put to other uses, like housing museums. The Ephesos collection sits in curved halls and giant staircases at the front of the building, where huge marble columns and white ceilings match the antiquities quite perfectly, as if built as a showcase for some Emperor’s collection of souvenirs from the super-rich equivalent of a Greek beach holiday. It would take a greater mind than mine to understand what constitutes a particular highlight, but the series of reliefs from the Parther Monument certainly contribute to that sense of wonder and scale. They come from a large and long frieze most likely celebrating the Roman–Parthian war of 161–166 and its victor, Emperor Lucius Verus. Researchers reconstructed the statue from broken pieces, as they did with another highlight, a 2nd-century statue of a baby squeezing a pet goose. All these works raise various questions about their origin, materials, creators, purpose, and more, but one question in particular stands out – why did anyone think it was a good idea to make a statue of a baby with a pet goose? You need a ticket to the House of Austrian History to access the Ephesos Museum, since the two share the same part of the Neue Burg building. Opening hours at the time of writing are Tuesday to Sunday, 10 am to 6 pm, with late opening to 9 pm on a Thursday. See the History Museum article for tips on how to reach the Ephesos Museum, since they share an entrance.